Hi! Tell me about yourself, about your company, what you're all about, what you do and why I should give you my time and money. Just give me a quick impression so I have an idea. You've got 5 seconds. Sound unreasonable? Humans now have a 7-second attention span before they lose interest if they aren't engaged. I think that's being generous. I don't give some things a glance if I'm not interested in a blink. I play peek-a-boo with my monitor. I've been doing it for years because it's difficult to get a fresh perspective. I sit in front of my design and cover my eyes with my hands, then I open my hands quickly and repeat as many times as needed. Feedback started within minutes, which is great because I like instant gratification. You know, short attention span and all. This morning my feedback page was full. 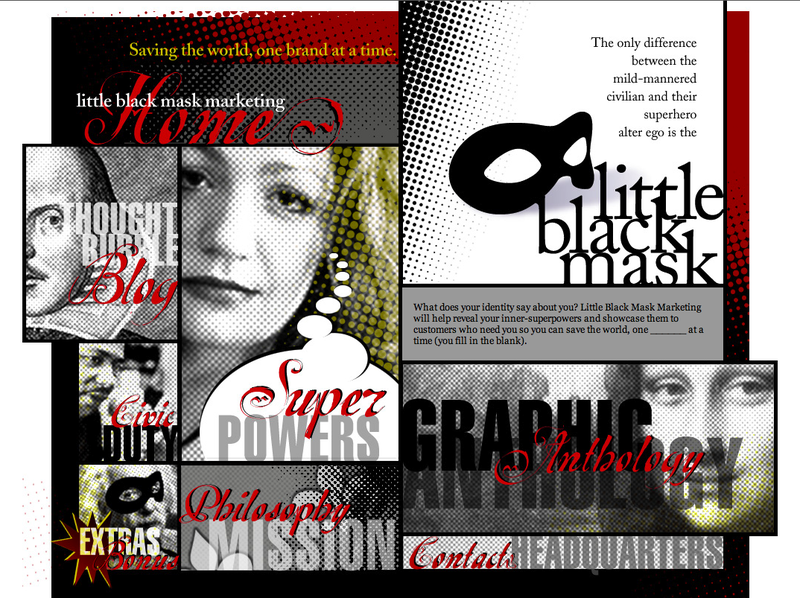 The good news: I am pleased to report that the little black mask name and logo were immediately memorable, the comic-book theme is well-conveyed, my saving-the-world philosophy comes across and the design seems to be liked. The neutral news: my face really stands out and looks beautiful. This is flattering and does have some recognition, but doesn't sell me unless you know who I am. The bad news: The word "home" stands out - and that's just navigational even though decorative. Also, "mona lisa," "faces," and "b&w photos" came up a lot - which again are decorative and have an underlying meaning but on first impression don't help the brand. The truth is, if someone goes to my site they probably do so for a reason that will keep them for more than 5 seconds, but it doesn't mean they'll ponder the meaning of it all and go in to read every page before calling me and offering me loads of money. Peek-a-boo impressions count. A change is in order. Immediately, I changed the word "Home" to "Branding." Since that word stands out so much and it's right under "little black mask marketing" then I've fixed that association. A website "massage" has been on my to-do list anyway, so I'm going to submit it to other feedback sites for more information first instead of just plowing forward on my own. Research is good. I'd love to hear what kind of feedback you get, share on the little black mask Facebook page. 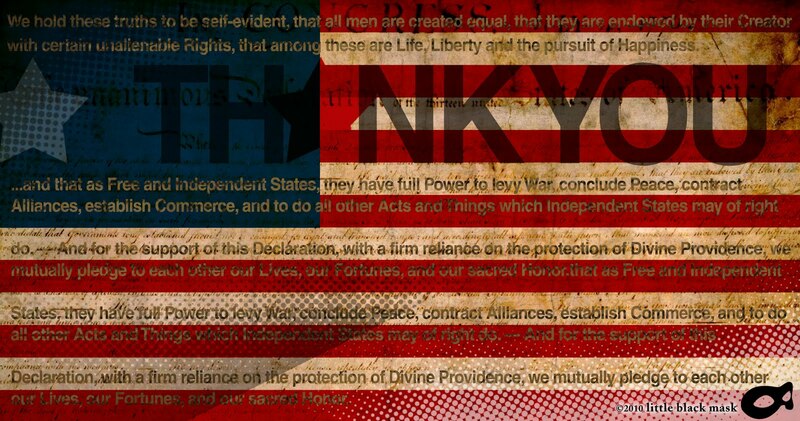 Independence Day is, on the literal surface, about the brave men and women who founded our country and the life of freedom they gave us. As our society rapidly progresses and changes, the world of our founding fathers seems farther and farther away. It's hard to relate, I can only wonder about what it was like. I imagine the US's original creatives – brilliant and progressive thinkers who came together to create a government for an ideal society, knowing in their hearts and souls that they would NOT live any other way. Today we whine about how our clients want huge logos and too much copy in their ads, about how we can't get the really great ideas approved because someone's secretaries' kid doesn't get it, or about how we can't get investment for that big idea that will change the world if only it had the proper chance. The obstacles we face in the modern world can own us, making us feel anything but independent. Imagine these guys in the late 1700's... no electricity or bifocals yet, no cars or airplanes, no faxes, emails or cell phones. What they had was an idea. You know the one – all men are created equal, life, liberty and the pursuit of happiness. They had to pitch this idea to not just one client, but to all "the people" - and they didn't need the people to simply approve this idea, they needed the people to give everything they had including their lives to ensure that this idea was realized. This July 4th, 2010, I challenge you to think about something you believe in so deeply that you would give your life for it. No, I'm not suggesting you commit hari-kari if you don't get your next best idea approved, but I am suggesting you chose some ideas you really believe in and you don't stop until you've made them happen. What are you doing that you are really passionate about? What do you really believe in? Let's take today as an inspiration. With gratitude for the freedom and opportunity we have, let's fight a little harder for our dreams.